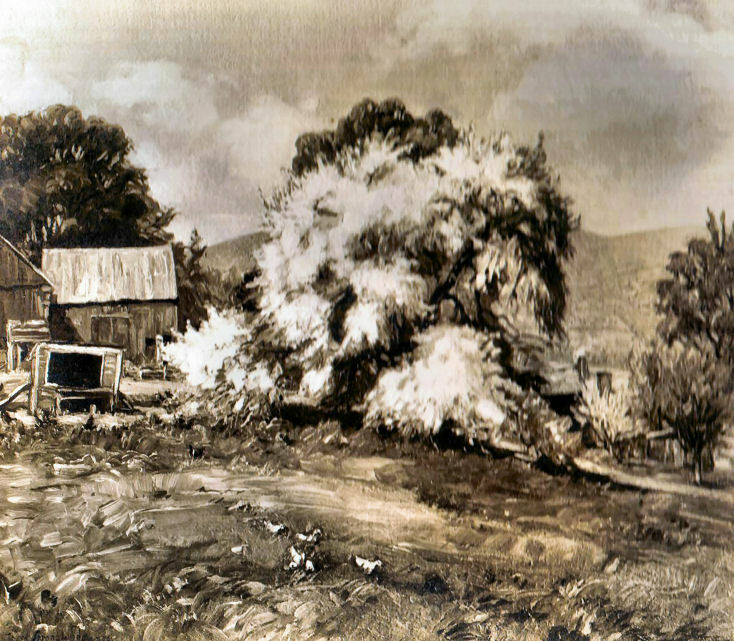 RSW- Artwork page, "The Greening Tree 27 x 30"
The Keach farm was so popular a subject for RSW, it has its own gallery. See also the The Greening Tree, 16 x 20 to view a related piece. "Painted in 1931. Painted at Keach's farm. Very large dramatic apple tree in very full bloom (white), little red barn and parts of Keach's house beyond --- over them the mountains under a blue and white May sky---foreground lush green meadow with some white ducks in the grass. Sold to Miss Shea, N.Y. in 1956." Did Woodward simply forget he did the smaller version? The 27" version exhibited quite often and didn't sell until 25 years after it was painted. Was RSW commissioned to do a version of the 27" but smaller to fit a particular space the client desired and without the ducks? It's unlikely because of the similar skies, but did RSW sit twice to paint each painting thus the different perspective the more "right" of the painting you go? Is there a chalk drawing of these paintings from which RSW worked from to create each piece? The assumption is that the 27 x 30 was the original because RSW almost never used 16 x 20 as a canvas size. Also Noteworthy: Although the sepia image is not of great quality, the skies of both paintings appear remarkably similar in context and perspective, making their relationship and RSW's never mentioning both paintings all the more intriguing. 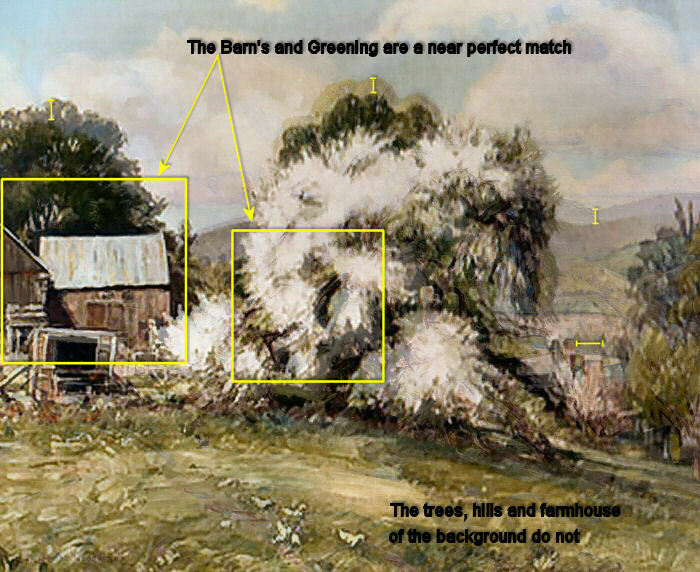 Below: Is a super-imposition of the two images and you can see the barns match perfectly but there are variable differences in perspective of the trees, hill and farmhouse in the background.